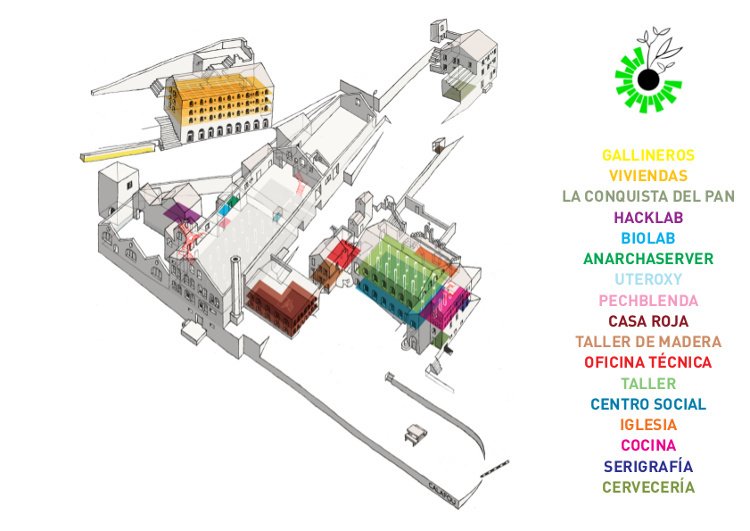 Calafou, the eco-industrial post-capitalist Catalan colony, organized Hack the Earth from April 14 to 16. Benjamin Cadon (Labomedia) tells us how a bio-political path, both sustainable and desirable, was outlined there. 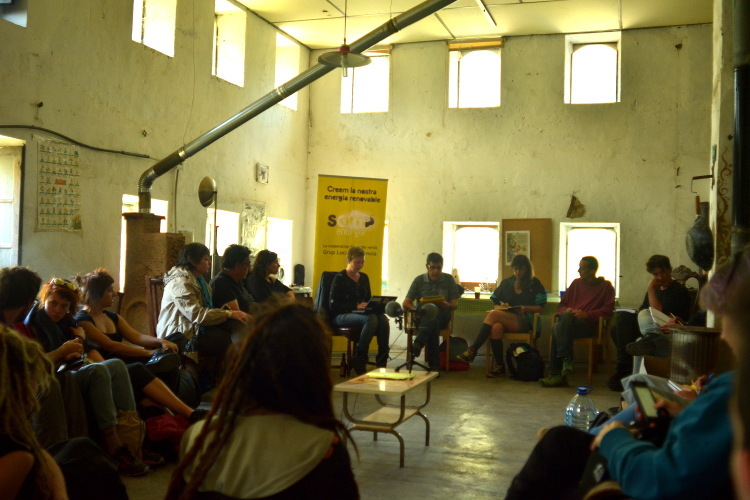 This is a political and practicing fertile-ground that has now been fertilized for five years in Calafou, during Hack The Earth (HTE), event based on workshops, round tables and conferences. All of this is structured around three spatiotemporal areas: the “Hacking” area where free technology, arts and science get mixed up, the “New Structures” around cooperativism, network organization methods, federation of skills, and the “Material” area where you can experiment the re-appropriation of traditional materials, where new techniques are being invented to contribute to more autonomy. 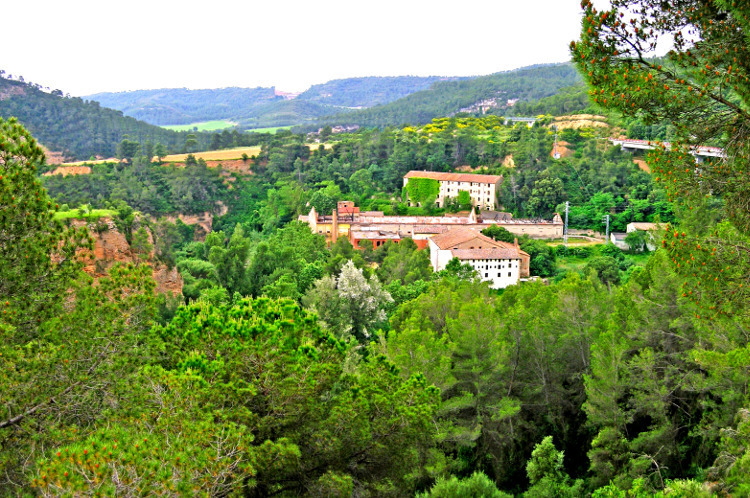 Calafou is a former “industrial colony” based in Catalonia, 60km west of Barcelona. There are about a hundred of them in the region, all built in the 19th century, a heritage from the first hours of the textile industry that took the energy from the rivers while regrouping workshops, housing, schools and places of worship in a feudal and patriarchal logic to control the workers and their families. It is in this place that the “Integral Catalan Cooperative” (CIC) chose to establish a new cooperative of social accommodation in 2011, offering the owner to rent it with a purchasing option in order to give it a new life and develop common goods and a new productive and economic life, with a logic of social and solidarity economy. To this day, about thirty people live there all year round and develop very diverse projects in the 28,000 m2 of the place: micro-brewing, IT development, bio arts, electro-bio-chemical experiments, gynepunk communities (one of the Pechblendalab projects), metal and wooden fabrication, energy and technology autonomy, phyto-purification, an organic producer network, food preparation…Without forgetting theme events which often bring together people from all over the world around topics such as ecological motors, autonomous tools for internet (backbone409), digital security workshops, open days and anniversaries, a rural film festival, Circassian meetings, self-managed projects, hack meetings, public digital libraries, TransHackFeminist events…See for yourself the history of all the events in Calafou. Flanked on one side by the most polluted river in Spain, and on the other by a highway bridge, Calafou is not a bucolic vacation place, but more of an uncomfortable area that is poetically endearing, in which emerge new imaginary worlds and where questions are raised about what type of degrowth we want and how to operate transformation by multiplying intervention areas. Imaginary gynepunk worlds, transhackfeminists, defending technology sovereignty and decadence, are directly tied to Calafou and its inhabitants. Nevertheless, the challenges remain plentiful, from the precarious economic situation of the project, the renovation processes that often lack suitable materials and the collective life of the place involving inventions, contentions and consensus on a daily basis. In the end, it is indeed this hectic human adventure (animal and plants) that makes it all worthwhile. Will we maybe need another few more to totally achieve the goal? 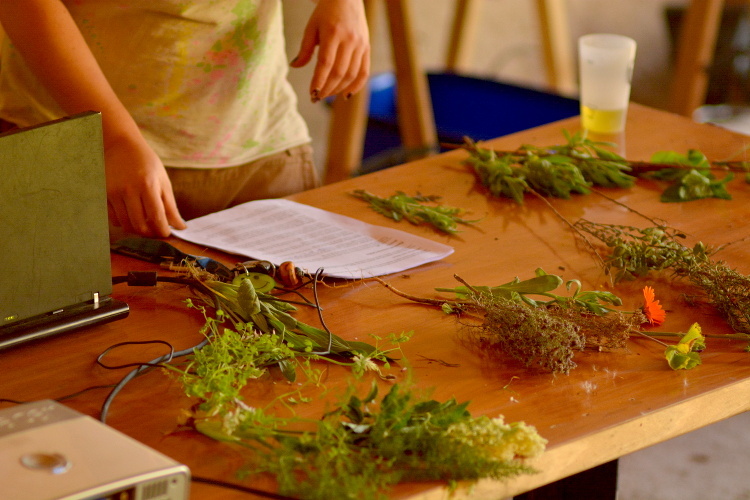 As a matter of fact, one rediscovers at Hack the Earth, from one year to the next, recurrent principles, especially around the idea of meeting your everyday needs with a low-tech approach of making together. In fact, this is about imagining how to build and maintain infrastructures for water, electricity, heating, IT services, by remaining as planet friendly as possible and the least dependent on a globalized system. Between the manipulation of nature and the commensalism with plants, bacteria and fungi, experiences and reflections are being carried out to purify water, use medicinal plants, monitor the environment quality and the diversity of its wildlife, produce compost, decontaminate soils, practice Arduino assisted permaculture or still…leave chickens to roam freely. The question of the colonization of bodies is also present, from DIY medicine and gynecology to our toxic practices of everyday life. Ecologist hackers as well as those turned towards IT exchange views and create knowledge around these questions. Which organizational and technological models to follow? More than a hundred people, principally from Spain but also throughout Europe, were able to meet for the 2017 edition of HTE that reflects this continuity with particular attention given to alternative organization modes to the dominant models. 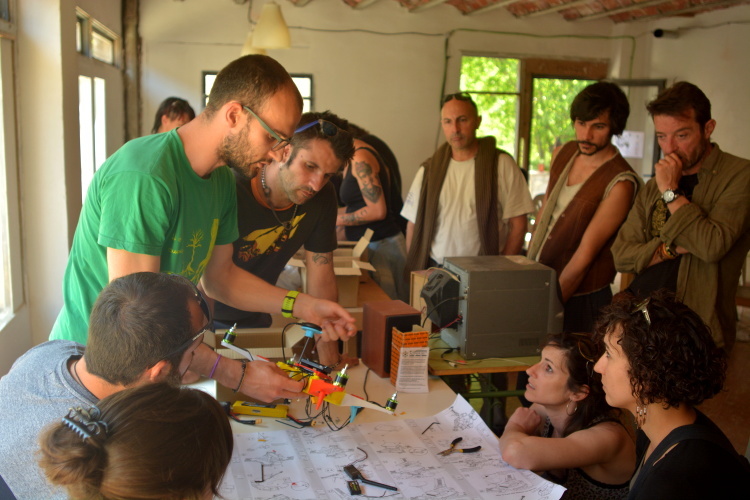 Cooperative of activities and jobs in the region of the Anoia, professional association of feminist creators and developers, renewable energy production cooperative, federation of the micro-brewers of Catalonia: many examples that demonstrate it is possible to be entrepreneurial differently and particularly in a way that shows more solidarity. A critical eye is also given to digital technologies that we use abundantly without always measuring the ecological and social cost. One talks about the electromagnetic spectrum as common goods, and drones and other cameras monitor the quality of the water in the river. One also learns how to reutilize used batteries, produce electricity with foam, make bamboo bicycles, melt metal with renewable energy, do lock picking, scan a book, listen to bats, relax by listening to wave-like music through your body. Finally, a speculative writing workshop around feminist technologies came to sow the imaginary of a future more suitable to the co-existence on this planet of living species and electro-digital devices with which we will soon mix. A fertile and desirable future in a transgender symbiosis of augmented voluptuousness.